Joy Creek Photo Archive (c) all rights reserved Cotinus coggygria 'Nordine' was developed and selected by the Morton Arboretum in Illinois. On our hillside its reliably purple foliage makes this showy small tree visible from afar. The leaves are rounded, measuring up to eight inches long. In the autumn, their dramatic color change to shades of orange and yellow are a sight to behold. 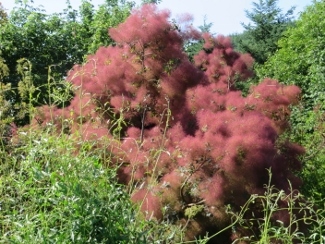 In summer, however, when the tree is smothered with its "smoke" of small airy flowers, it is perhaps the most noticeable. June 12-15 ft. x 12/15 ft.